The packaging is very simple and elegant, typical for Estee Lauder products. What slightly disappointed me is that it doesn't come with a foundation pump, or any other form of applicator. You can purchase these pumps separately, but I find it annoying that despite paying £30, we are given what seems to be an 'incomplete' product. This also means that you have to keep this foundation air-tight at all times to avoid contamination. The formula is easily the best thing about this foundation. It really 'sticks' to your face, whilst feeling incredibly lightweight on the skin - you'll forget you're even wearing it! Despite being advertised as fragrance-free, this product has a slight, chemical scent to it, which fades away when applied. Aside from that, I have only good things to say about the formula - the coverage is medium to full, easily buildable with a Beauty Blender. It really gives you that gorgeous, dewy, airbrushed finish which lasts all day. When I asked my boyfriend about his thoughts on my makeup, he said that my skin looked 'radiant' - and that was twelve hours after applying it! 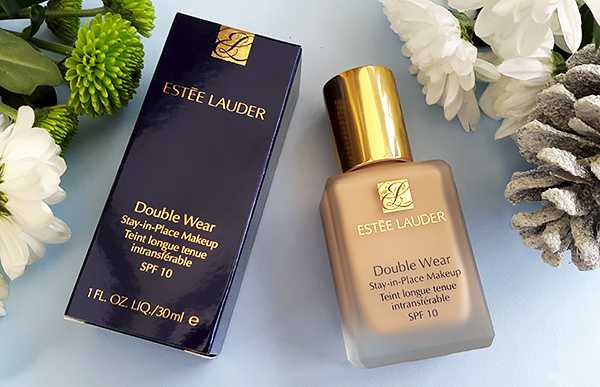 Double Wear is perfect for anyone with oily skin - it will keep your makeup under control, and you won't need to worry about having to use blotting tissues or mattifying powder throughout the day. Left to right: No makeup, Double Wear foundation only (with primer), full makeup. Despite its effectiveness, there is a big downside to how 'heavy duty' this foundation really is. It feels incredibly drying on the skin, especially if you wear it for more than a couple of days in a row. It also seems to accentuate certain problem areas, rather than mask them. I have a few dry patches around my nose which became more visible after wearing this foundation for a few hours. This is something that you should keep in mind if you're considering purchasing Double Wear - does your skin dry out easily? If so, then you should probably avoid this foundation. Whilst it offers great coverage and lasts all day, it can be quite tiring on the skin, and it took me ages to get it all off in the evening. This is the kind of makeup that won't come off until you decide to take it off, which might be what you're looking for, but it's important to keep in mind the potential consequences to the health of your skin. After wearing this foundation for three days in a row, I ended up with dry skin, clogged pores and a few breakouts, so please be aware that this may happen if you have problematic/dry skin. Overall, I think that Double Wear is a very good, high-end foundation, and I'd give it 6.5/10. It provides great coverage and gives the skin a healthy, dewy finish, but not without its downsides. I wouldn't wear it on a daily basis because of how tiring it is on the skin, and I'd definitely recommend avoiding it if you have dry skin and major problem areas that you don't want to accentuate. Is it worth the hefty price tag? Honestly, I'm not too sure. I don't regret buying it, but I probably won't be re-purchasing. If you have a budget-friendly, drugstore foundation that you're happy with (for me, it's the Miracle Touch Liquid Illusion foundation by Max Factor) then I'd probably stick to using that! 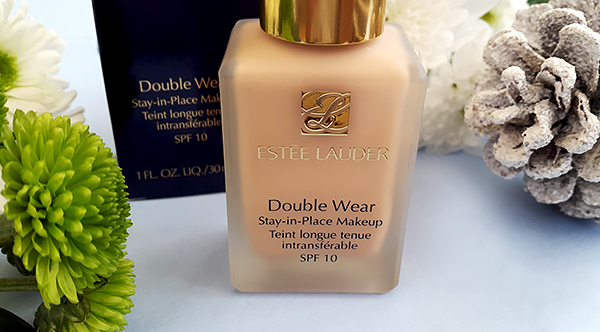 Have you tried the Double Wear Stay-in-Place Makeup by Estee Lauder? What is your favourite high-end foundation?